BACKGROUND: This internationally recognised brand specialises in the retail of toys, clothing, video games, and baby products. Toys R Us Canada operates over eighty stores across the country where the strength of the brand has proven very resilient to online competition from large international digital competitors. 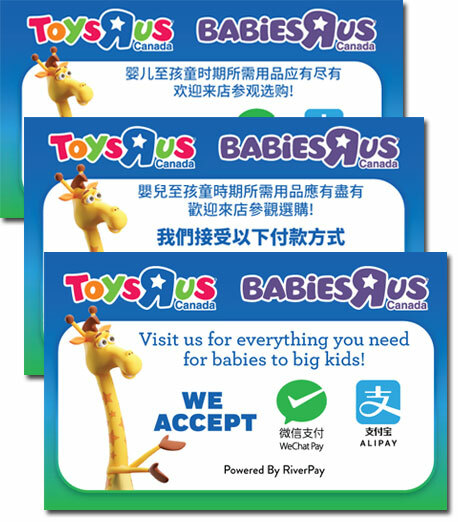 OUR WORK: Recently Toys R Us stores in areas with significant Chinese demographics began accepting WeChat Pay, the extremely popular and ubiquitous digital currency used by consumers across China. Our Vancouver ethnic marketing team assisted this campaign by providing Chinese translation, media recommendations, graphic design, execution, and reporting.